Following the police state spectacular at the G20 last June, the cops were accused of infiltrating so-called black-bloc anarchists, who engaged in all sorts of pointless mayhem, including trashing a Starbucks and burning police cars (see video below). The corporate media had a field day covering these circus sideshow distractions while ignoring the larger issue of the globalists meeting behind closed doors and plotting to sell the national sovereignty of millions down the river. It was necessary for the state to arrange this sort of meaningless property destruction in order to offer a public rationalization for spending nearly a billion dollars on police state “crowd control” equipment (including L-RAD sound cannons) for the globalist summit. The Canadian state also granted the cops special police state powers by expanding the jurisdiction of the existing Public Works Act to apply to high-security areas of the summit site. It is now an indisputable fact the cops engaged in massive infiltration. According to newly released G8/G20 summit documents, the RCMP dispatched poseurs and agents provocateurs to infiltrate the ranks of anti-war, anti-globalization and anarchist groups. Photographs released showed the supposed “anarchists” wearing the same boots as the police arresting them. “Protest organizers on Wednesday played the video for the media at a news conference in Ottawa. One of the organizers, union leader Dave Coles, explained that one reason protesters knew the men’s true identities was because they were wearing the same boots as other police officers,” CBC News reported on August 23, 2007. Reports filed by the Joint Intelligence Group formed by the RCMP-led ISU (Integrated Security Unit) reveal that various police services contributed at least 12 undercover officers to take part in covert surveillance of potential “criminal extremists” in a bid to “detect… and disrupt” any threats, according to CBC News. In other words, the RCMP was assigned the task of discrediting the larger anti-war and anti-globalization movement and making the public believe they are bomb-wielding anarchist criminals. The same mindset and illegal police state activity operates in the United States. Since the FBI’s use of CLOINTELPRO tactics to neutralize political opposition to the state in the 1960s and early 70s, such practices have been uniformly codified and are now widespread and routine in the so-called war on terrorism. - The RCMP set up a Joint Intelligence Group in January 2009, which in turn assigned a dozen officers to a covert PIIT (Primary Intelligence Investigative Team) expressly for monitoring and infiltrating suspected extremist networks. - The joint-forces PITT had a mandate to use undercover officers and informants from within the ranks of protest networks, not just to monitor potential criminal activity by organizers, but also to “deter, prevent, investigate and/or disrupt” threats to the summit. - The investigative team created and shared files on a long list of individuals, color coding them according to perceived risk level as red (suspect), orange (person of interest) and yellow (associate). 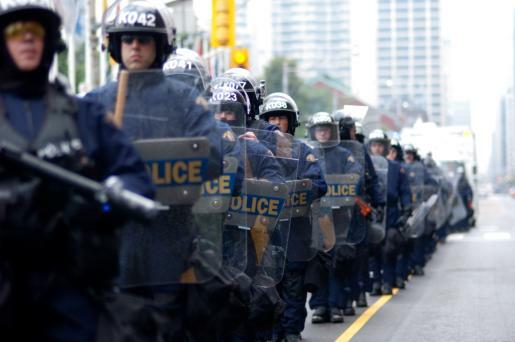 Following the June summit in Toronto, a number of so-called black-bloc anarchists were outed as police agents provocateurs. Such reports were covered by the alternative media and generally ignored by the corporate media that had characterized the demonstrations as lawless behavior by a handful of crazed extremists. “It is hopeful that in the days, weeks and months to come government and police will be forced to admit (under similar circumstances as in Montebello, Quebec in 2007) that much of the vandalism and fire-setting was undertaken by those encouraged, directly or indirectly, by agents provocateurs,” Canadian activist Ghada Chehade wrote following the summit. Unfortunately, it took more than a few weeks for the truth to come out. It took exactly a year.